This is a selected chronology. 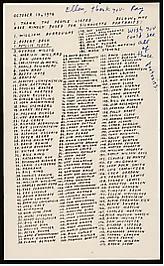 A full chronology is available through the Ray Johnson Estate. Correspondance: An Exhibition of the Letters of Ray Johnson is mounted at the North Carolina Museum of Art in Raleigh: 81 lenders contribute mailings from Johnson covering 35 years of mail art and letters. First Shelley Duvall Fan Club meeting, Brooks Jackson/Iolas Gallery, New York. Awarded National Endowment for the Arts and Creative Artists Public Service Program (CAPS—New York State) grants (1977). Portrait collages exhibited at Benson Gallery, Bridgehampton, NY, and Framart, Naples. 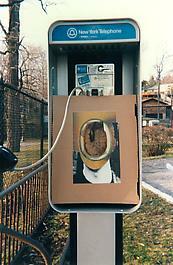 1978 is the last time Johnson allows a commercial gallery to hold a solo exhibition of new work. 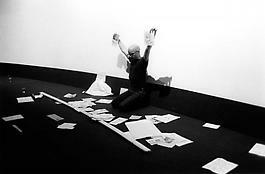 Over 11 “performances” and “meetings” in 1977 alone, including The Unopened Letter, Second Shelley Duvall Fan Club, Dead Bird, Flying Eyeballs, A Throwaway Gesture performance, Walker Art Center, Minneapolis and Another Throwaway Gesture performance, Rhode Island School of Design, Providence. In 1980 the Mail Etc., Art exhibition and catalog, University of Colorado, Boulder, contains interview with Ray Johnson. Chuck Close makes six 20-by-24 inch Polaroids of Johnson at MIT (1979). Johnson meets Salvador Dali at Studio 54, where Dali has a “table.” Johnson calls Dali’s bodyguard, his “life guard.” Warhol is also a frequent habitué of the famous New York discotheque and celebrity-watering hole. Continues some mailings, but rather than redistributing articles and objects sent to him, begins placing many in cardboard boxes which he often gives away. About this time, Johnson begins drawing finger and hand silhouettes and incorporating them into collages. Artpool’s Ray Johnson Space opens in Budapest, Hungary. From 1982 on, Johnson repeatedly refuses offers made by Frances Beatty at Richard L. Feigen & Co., both in New York and Chicago, and other art dealers, to give him an exhibition. He works in increasing isolation, chiefly communicating with friends and ‘correspondants’ through the mail and the telephone.